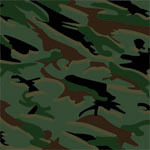 Our classic military camouflage pattern in a woodland coloring with greens, browns, and blacks. Take your device hunting without fear of being discovered. Just remember to put it on Silent.